Samsung Display will focus on LCDs and LCDs only. LCD TVs are big business for Samsung. With the full acquisition of their former joint venture with Sony, the business got even bigger. 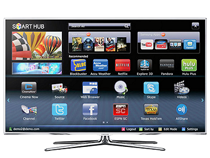 To help better manage the massive TV business, Samsung is splitting it off into a company of its own. The soon-to-be formed Samsung Display is set to be launched in April with $6.6 billion to play with. This move will not only make the business of displays easier to deal with, but will make it easier for Samsung to make changes to LCDs and adapt to the industry with speed and efficiency.